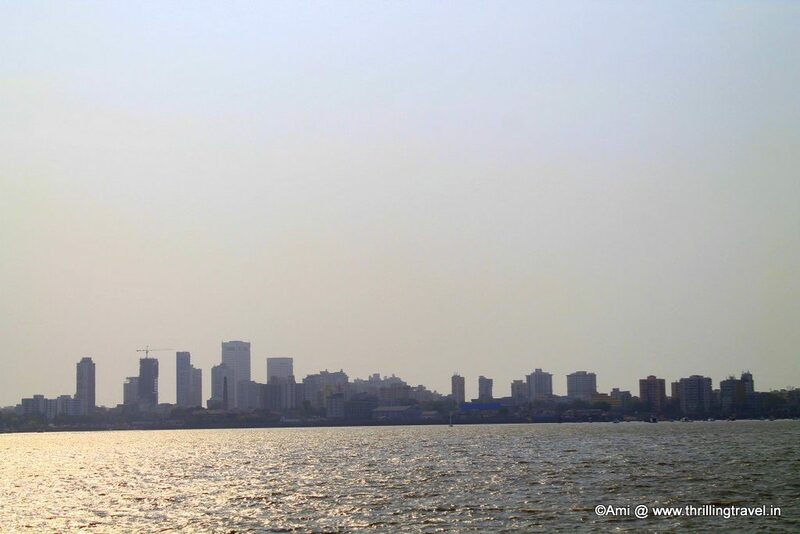 Mumbai – a city that I have spent considerable time in. Earlier for a transit as I was staying the Gulf, later as a short vacation spot with cousins and then with as a business hub. Thanks to my marketing career, there was no escaping Mumbai. However, in all these years, it has been all air, road and railway that has taken me into the bustling city of Mumbai. 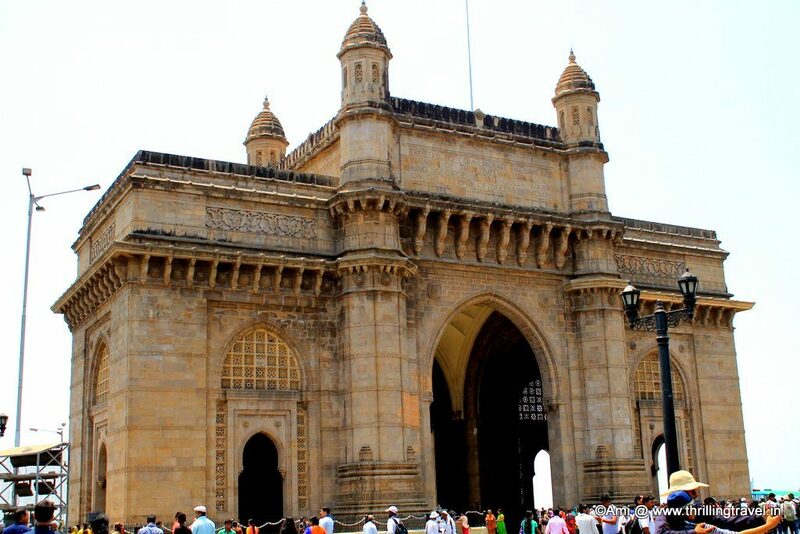 Never for once, did I ever think of entering Mumbai as the British Viceroys – from the sea through the Gateway of India. Thanks to my cousin, this time around we did enter Mumbai through the Arabian Sea, just as the British did. We had planned a trip to Alibaug and it was my cousin who suggested that we spend one day in Mumbai as it was just a 45 minute ferry ride from Mandwa. 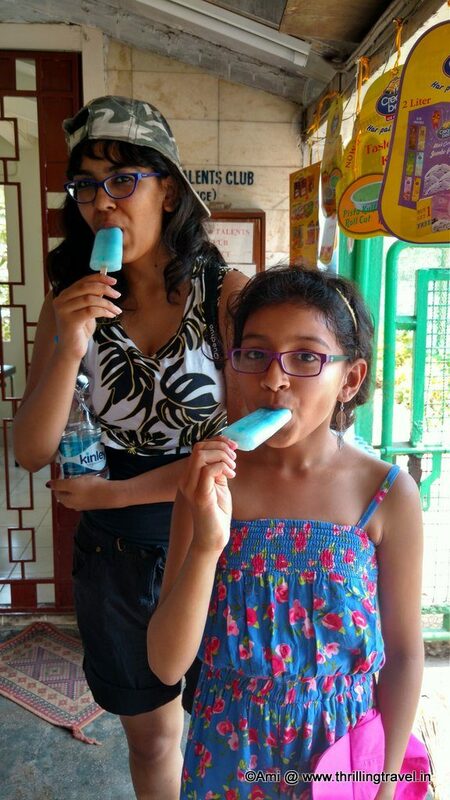 My daughter clapped her hands in glee for she had never been to Mumbai and was raring to get there. 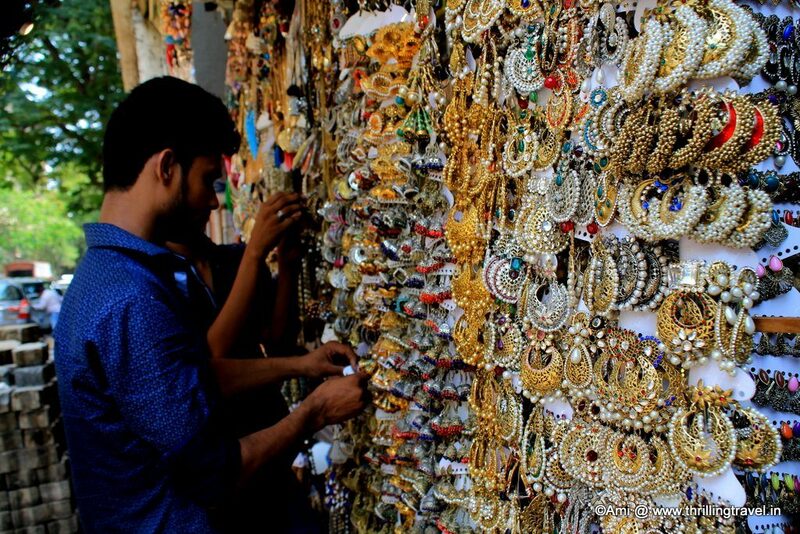 I lapped up the suggestion for I was already transported to the fun that I would have street shopping at Colaba. My vivid imagination took over and I was transported back to the era when possibly I had entered India through the official Gateway of India as Her Highness Queen Mary. So, let’s all go back in time to the days of the British rule in India as I, the possible Queen Mary take you through my maiden voyage to the hot and vibrant India. My beloved King George V, the new Emperor of India decided to head to his new empire to explore his new territory and see for himself all that he had heard of. Everyone said that India has treasures all over, but it was hard to believe it till we had seen it ourselves. So, we docked off towards India through the endless deep blue waters. As we entered the Arabian Sea, the sun got stronger and stronger, so much that standing on the deck was no longer an option during the day. We escaped into the cool interiors of the ship. I was told that they were building a magnificent Arch in our honor, quite similar to what was in Paris – the Arc de Triomphe as built by Napolean. Ooh! How splendid it would be to have one for ourselves! I could not wait to set my eyes on it but for the moment, I had to be content looking at the occasional vessel in the sea and gulls that were keeping us company. Finally the men on the deck announced the nearing of the shores and yonder, we spotted the end of the blue waters. I clapped my hands with joy as we spotted the hazy outlines of the city buildings and there it was, my own Arc de Triomphe. They called it the Gateway of India and as our vessel neared it, I whispered to George – “The structure does not seem complete. Are you sure we are at the right port?” George replied to me “Of course dear. I ought to have mentioned this before, but the gateway was yet to be commissioned and what you see it just a cardboard model of the actual”. I called my maids to hand me some smelling salts for I was faint with shock. My own Arc de Triomphe was not ready ??? However, my shock turned into a pleasant surprise as I stepped aboard India through the magnificently carved Gateway of India. 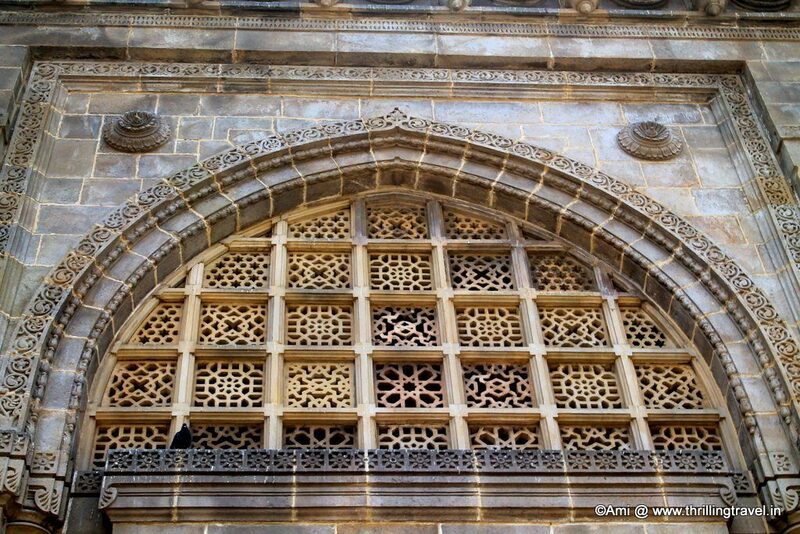 Complete or not, the architectural details planned for the Gateway of India was truly splendid. 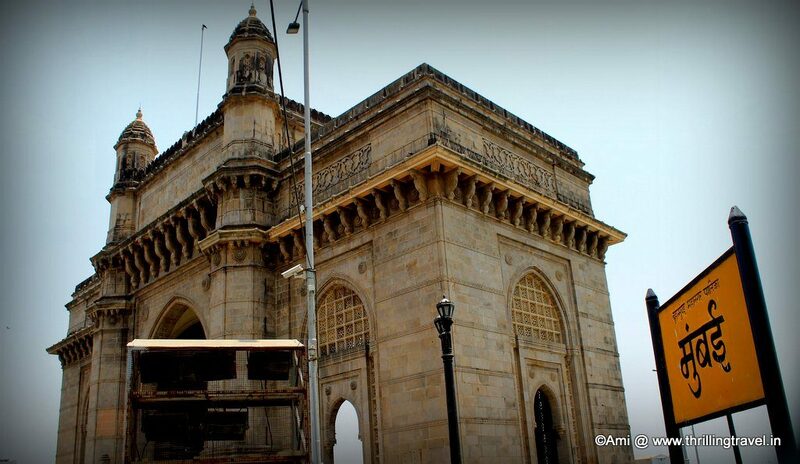 My British friend and the Governor of Bombay – Sir George Sydenham Clarke whispered to me that the planned designs would involve European designs mixed with some Gujarati and Muslim architecture – making this Gateway of India different from the Arc de Triomphe. I could already spot the same and it made me happy to have something different from the Arc de Triomphe in our honor. Sir George further apologized for the delay in the construction and explained to me the difficulty that they were facing – they need to reclaim land from the sea and then, start building this beautiful building in our honor. The honor was truly mine as I found an inscription with George and my name on the Gateway of India, a sign that would remain for the generations to come and for me to rediscover the real gateway in 2016. Queen Mary (essentially me :-)) in 2016. Rediscovering this landmark and reliving my maiden voyage was truly wonderful. It was still stifling as we entered the Port of Mumbai and this time. we did not have a large band of musicians greeting us. There were no people to fan us from the heat and hence, we headed to cool ourselves with some ice. The place that we had stayed in – The Taj Hotel, was still standing strong and looked as magnificent as ever. I had read about how some vandals tried to use it to spread some terror. I was just glad that the building remained as strong as the spirit of India. Of course, there was no way that I was going back to George without taking a picture against it. 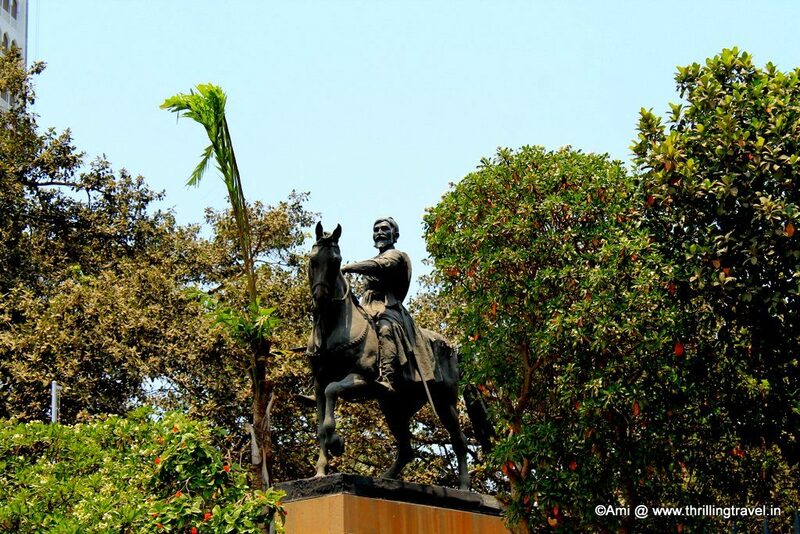 Walking along the road, this time, I found a huge statue of Chhatrapati Shivaji – the brave guy who dared oppose us when we were in India. The statue was truly magnificent and I found myself praising the guy for his bravado and values. Further on, we entered the Colaba Causeway. It no longer looked as it used to but here and there I found those old heritage buildings. As we turned towards the street, we encountered a huge row of treasures. We went berserk trying out all those and the ones that suited us were added to our collection for some rupees. 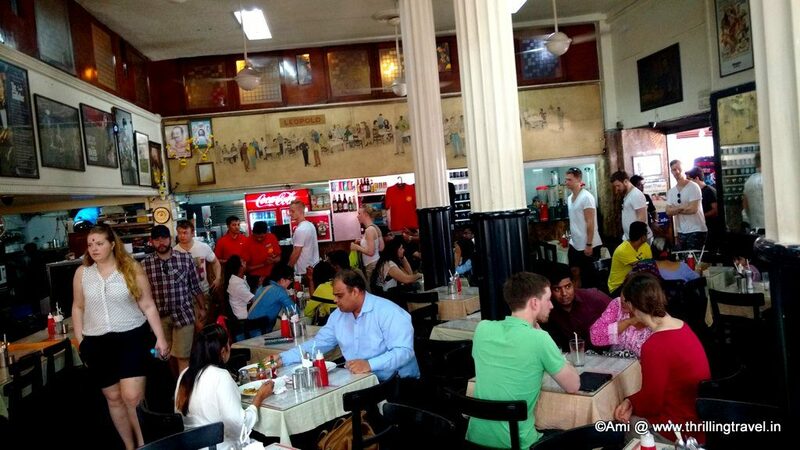 Tired and hungry, we stepped into the old Leopold Cafe, another one of those brave structures that survived the terrorist attacks of 26/11. The remains of that incident could still be seen on the walls as bullet holes but the cheerful spirit of the place could not be dampened by that incident. Heading back to our ship, I stepped back to take that last look of Mumbai. The same gateway that I bade goodbye to the last time I left this shore. The same one that bade goodbye to our rule in India, where the last of our viceroys and British officers left back to head home to England. 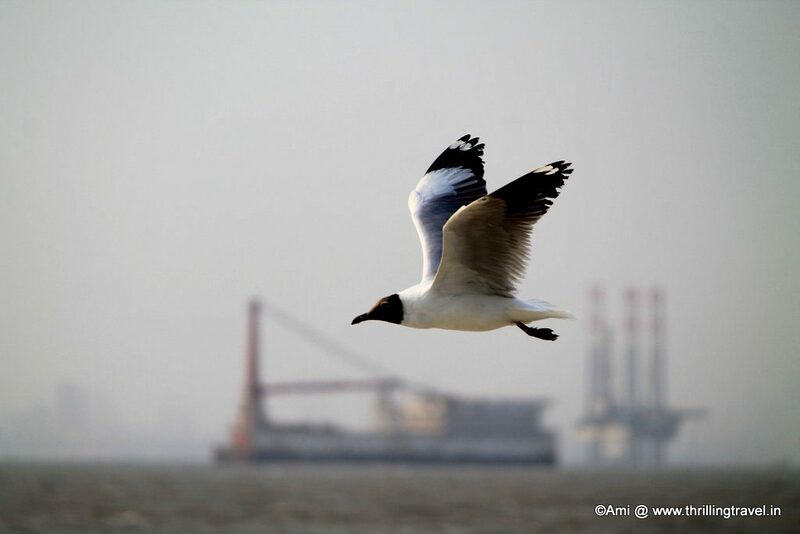 The stunning Gateway of India stood strong as we headed back home with seagulls, keeping us company till we reached the next shore at Mandwa. Back to me being me in this present day. It was commissioned for the visit of King George V and Queen Mary in 1911 but was not completed by the time the royal visitors arrived. The plans were delayed owing to the land that needed to be reclaimed. The Gateway of India was completed only in 1924. There was a dummy cardboard Gateway that was erected in 1911 for the visit of King George V.
The last of the British ships did leave India from the Gateway of India. 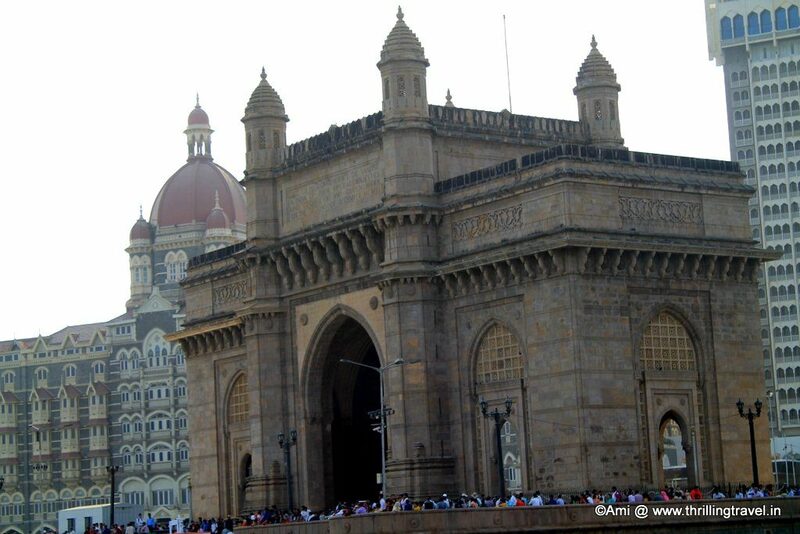 The Gateway of India is a landmark destination in the urban city of Mumbai. 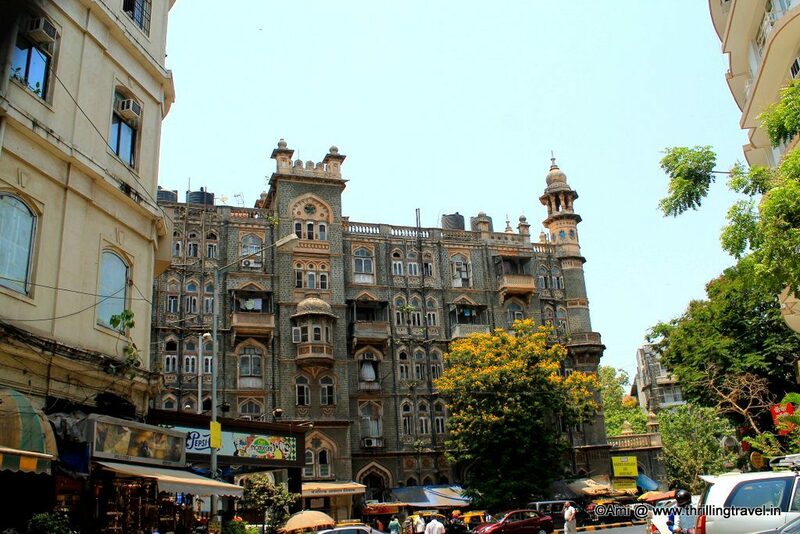 Getting here from Mumbai is easy, thanks to the local transport – bus and taxis being the most convenient. 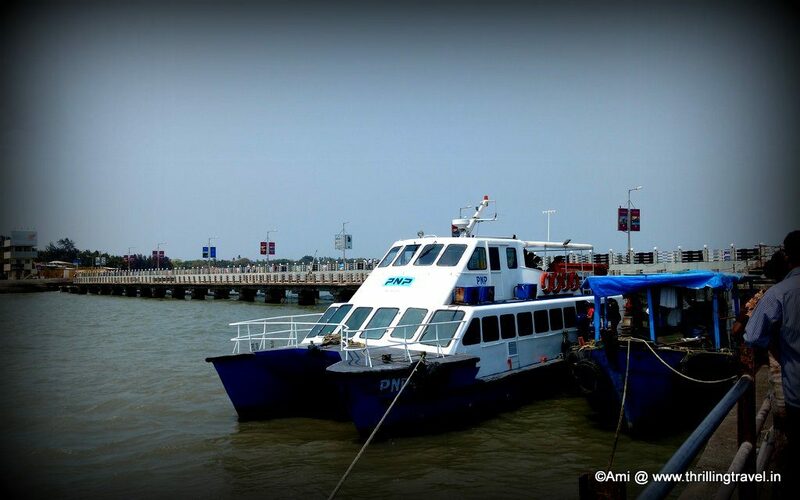 To take this ferry ride to Gateway of India, one needs to head to the Mandwa jetty in Alibaug. Alibaug is just 140 kms from Mumbai and around the same distance from Pune. It can be reached by road – buses or cabs, from either of the two destinations. There are plenty of Ferry operators at both ends of this trip – Gateway of India as well as Mandwa Jetty. 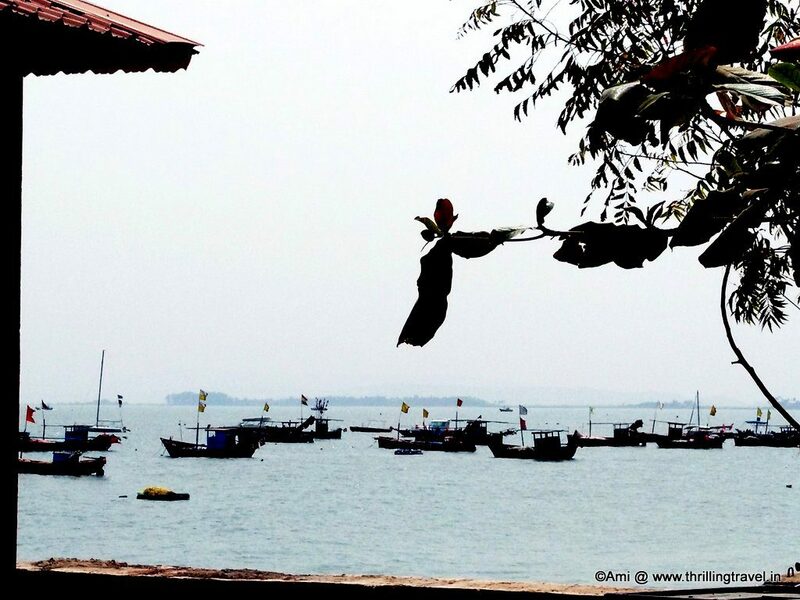 There are regular ferries every hour and one does not have to pre-book the same. You can even opt for an AC ferry. The distance can be covered in 30 – 45 minutes. The jetty at Mandwa has a restaurant, a waiting room as well as rest rooms for you to rest. The charges for the ferry range between INR 120 – 165 per adult. When at Gateway of India, you can even take another ferry to the Elephanta Caves, a historic site in the middle of the sea. This is a 50 minute ride one way and one can experience the history and art of the caves here. There are several vendors selling water, juice and snacks on the Ferry. The Mandwa jetty has a paid car park service too. 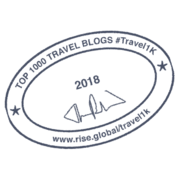 You can combine this tour with a trip to Alibaug. Your pictures are superb!! Good job! Wonderful wonderful narration. I also love the glimpse of the Taj (hotel) through the arch. 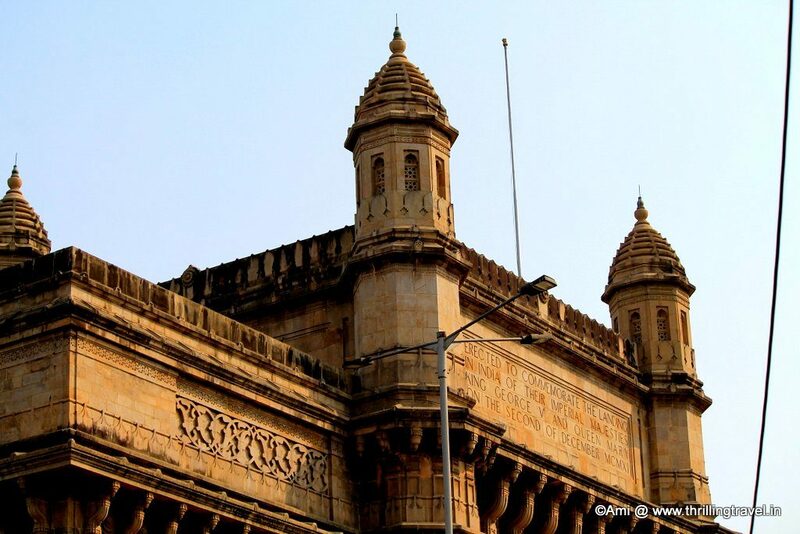 I never miss to spend a long evening by the Gateway, and strolling through Colaba causeway when in Bombay! Whoa! That is a grand entry! Great captures. I didn’t know so much of the history part. Thank you Indrani. The street shopping was just amazing. Wish Bangalore had something like this. Thank you :). I want to do the ferry to Elephanta the next time on. Mumbai is a magical city, am very familiar with the city, having lived there and also visiting for business and pleasure regularly, love everything about the city, from the local trains, to Gateway of India, Leopold Cafe, Linking Road to seeing movies in Bandra and eating Chat at Juhu. Enjoyed reading the Queen Mary’s version through your voice 🙂 Have been in the ferry as a kid to Elephanta caves. I need to try this one out soon. I loved your perspectives…so fresh and creative! Great read for sure…those wonderful shots added to the charm of reading. Thank you. It sure is a lovely experience. Interesting perspective on the history! It may not have been completed on time, but it’s certainly impressive. Thank you Marianne. I have always found the Gateway very impressive. And approaching it from the sea was even more so. Water is a fun way to travel. I can so see this, having enjoyed the Circle Line tours of New York City (where you ride a boat which travels around Manhattan Island),If I do that again I will have to make believe I am the President of an earlier day. Well done! Thank you Alana. It sure is a different perspective when you think of how it was in those early days. Truly a delightful narration of your trip. 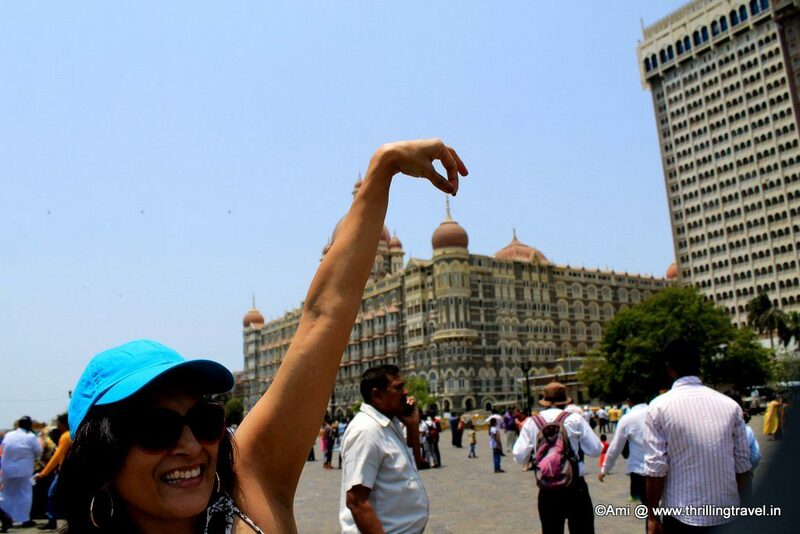 Loved the seagull against the blurry ship and the picture of you holding the Taj by the tip. I only spent one day in Mumbai and stayed very close to the Gateway: thank you for the memories through your beautiful photos! Looks like a great place to visit and explore history. Love those old heritage buildings. No doubt that Mumbai is a unique city where life is strange but somehow enjoyable if you have an entrepreneur mind. Stayed in Mumbai back in 2006 for a week and I still remember it. Thanks for reminding those awesome memories. 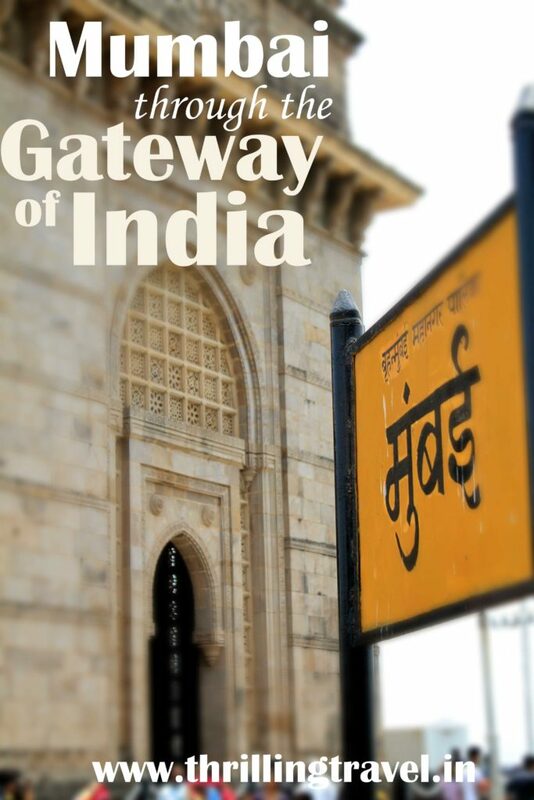 Hey Ami, the Gateway of India sounds like an impressive project. For the cardboard version to have such details is stunning in itself. We’ve never been to India but will definitely be coming back to this post when we do. 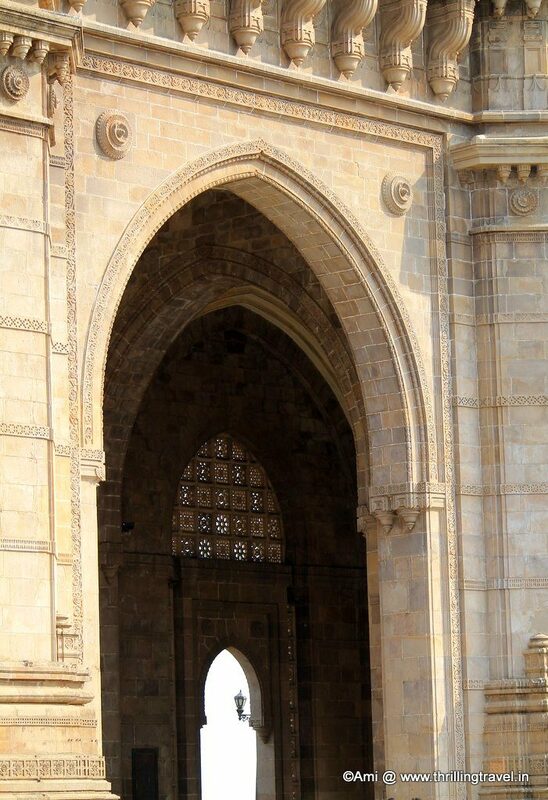 The architectural details of the Gateway of India are awesome! IT’s going to be beautiful when it’s done. I like the trip through history. (I might have to use that). great way to tell the history. Sounds like a great journey. I love to visit and read about historical landmarks. This looks like a really nice trip. Someday I will visit India! It sure was. Though I have been to this city so many times, it was quite different this time around. I think the first-person narrative is my new favorite and completely fitting to telling the story of this interesting landmark. It’s fun and adds a new perspective. Thanks Rob. I enjoyed imagining it myself. You can’t beat a good arch! Lovely. Beautifully written Blog. Making me fall for the place all over again. 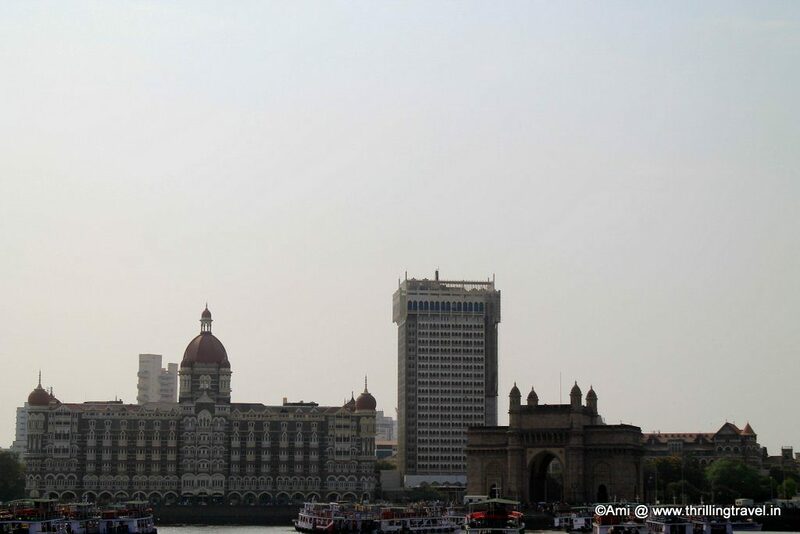 Never seen Mumbai from the perspective of Gateway of India. New and innovative! 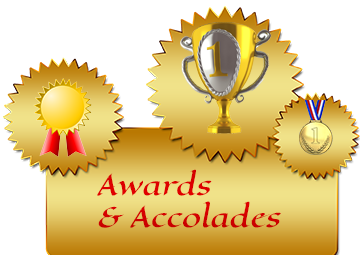 Thank you Sonali. Glad you enjoyed this one. 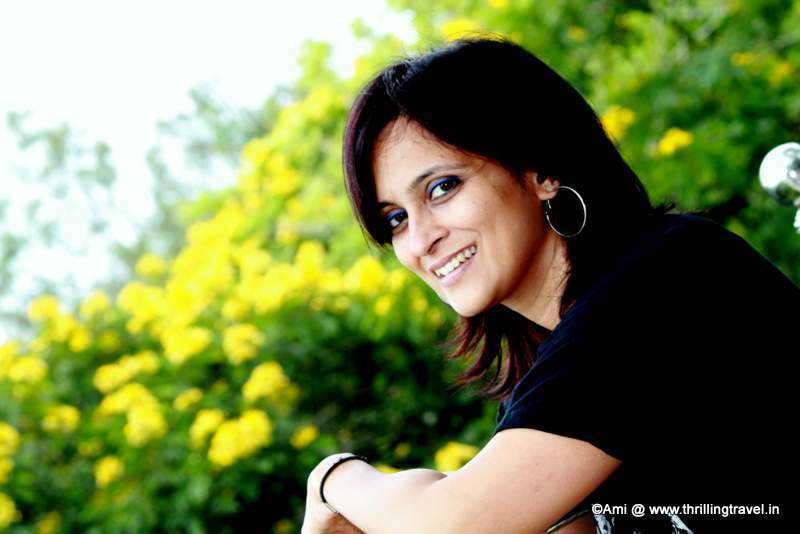 Nice Blog and it serves the purpose, the cause of writing, well I expect more of such work from your side….